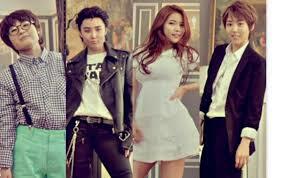 Mamamoo Raise Some Eyebrows in "Um Oh Ah Yeh"
Ever since their debut, many have been infatuated with Mamamoo. They’ve got killer vocals, killer songs, killer stage presence, killer dance moves, and, once again, killer vocals. Everything these four ladies do is magic, oozing with charisma and feminine confidence in a world of hip-hop and aegyo, and “Um Oh Ah Yeh” is no exception. Over the last year and a half, there has only been one semi-complaint about Mamamoo’s output in my mind: there’s a bit too much retro here. As amazing and unique as the jazz/Motown throwbacks of “Mr. Ambiguous”, “Piano Man” and “Ahh Oop!” are, I wanted to see them spread their musical wings and change it up. As of “Um Oh Ah Yeh”, consider that challenge completed. “Um Oh Ah Yeh” is still a genre throwback, but it’s to a far more recent time: the late 90s. It’s very bubblegum-ish in sound, but there’s still enough R&B influence to keep their sound present and recognizable. Instrumentally, it’s like the crisp cleanness and pep of the Spice Girls and the rich vocal layering and sass of Destiny’s Child had a baby. The major riff of the song is a keyboard– another 90s relic– and one that is so lovely, mirroring the vocals before breaking off to serve as punctuation for Mamamoo’s confident wooing. The MV serves to highlight the message of “Um Oh Ah Yeh”, namely that if you want something — or someone — go for it. Moonbyul, Whee-in and Hwasa are all in drag, while Solar tries in vain to attract the attention of the pretty boy, played by Moonbyul, while fending off nerdy Whee-in and Hwasa the greaser. Everything Solar does is a definitive action, which is a glorious change of pace from most MVs, where girls sit and wait to be noticed. She flirts, and gets very physical while she’s doing it. Solar doesn’t wait for the jerk harassing her to stop, she makes him stop rather than suffering anymore. It’s hard to remember another MV where the female leads were just as active participants in the action as any men. The comedy of the MV is also quite strong but it missed the mark in some big places. The comedy bits are mostly based around Solar getting stuck as the only sane woman in a world of crazy guys, but even she has limits. The incompetent doctor, the drugging of a particularly rude patron, the reveal that the pretty boy is actually a handsome girl, these all work great. But Hwasa’s pawing of Solar and Solar’s perving on Moonbyul leave a bad taste in my mouth, because sexual assault is never funny. It doesn’t matter how much wish fulfillment I get out of seeing Solar brain a handsy guy with a tray. Seeing her pinned underneath a guy who is trying to touch her and won’t take no for an answer makes me very uncomfortable, as does touching someone who is unconscious and unable to consent. It doesn’t ruin the whole MV, but it does make me want to mail WA Entertainment a brochure on the concept of “yes means yes”. The dance interludes are that rare thing, dance shots that are just as enjoyable as the rest of the MV. They allow Mamamoo as a whole to exude the energy that the plot doesn’t allow for, making them just as engaging. I’m not sure what a very brightly painted bathroom and a dingly salon have to do with going after a guy with confidence, but I don’t care. The styling is top-notch, with both the bright retro look Mamamoo has been known for, and the 90s throwback styles for “Um Oh Ah Yeh”. Seriously, I have not seen that much denim in one place since 1999. The MV for “Um Oh Ah Yeh” fails to deliver on the wonders of “Ahh Oop!” and “Piano Man”, but the song itself is a smashing hit. For Your Viewing Pleasure: Bring The Girls (Generation) Out!